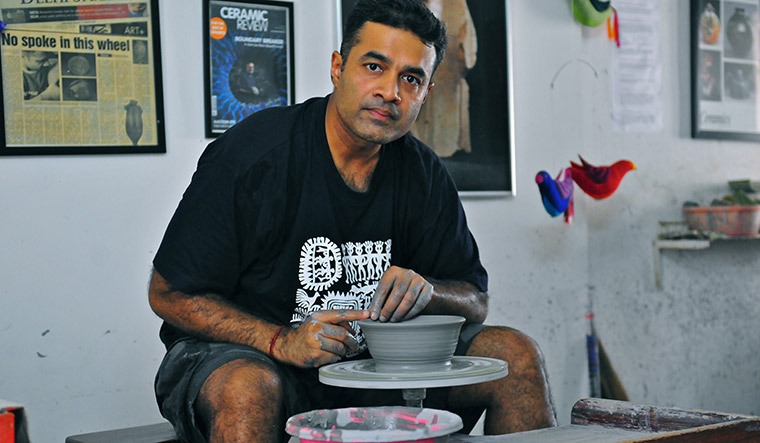 RAHUL KUMAR IS a ceramist. The round form of the circle, like the potter’s wheel, is intrinsic to his artistic vocabulary. But, he is adding a new, speculative dimension to this idiom of the circular and the concentric. In his latest work Terra Geometrix, he has collaborated with a painter to engage with metaphors of urban geography and cityscapes. Heavily textured round discs, fired in clay in varying sizes, sometimes cut apart, recall urban landscapes. There are roads, manholes and trees. His collaborator Chetna, who works compulsively with lines, has slashed and sliced through these textures with linear patterns. Like city grids. But, there are other components, too, which pay homage to Jaipur, which will host this artwork soon. White-coloured pieces with blue jaali work are overlapped with gold, to signal lost heritage, royalty and preciousness. This 10 by 8 feet sculpture conveys “a certain sense of urbanness”. Not your typical artwork in clay? Idols, tiles, bowls and teapots, plates and pitchers—Delhi-based artist Kumar reels off a list of objects popularly associated with ceramic art. Utilitarian or decorative, they have pleasing, voluptuous curves with gleaming skin. But, what if they were completely disjointed from a function? For Kumar, a ceramic artist for the last 24 years, the time has come to show the monumental possibilities of clay—a potter’s favourite medium of expression. 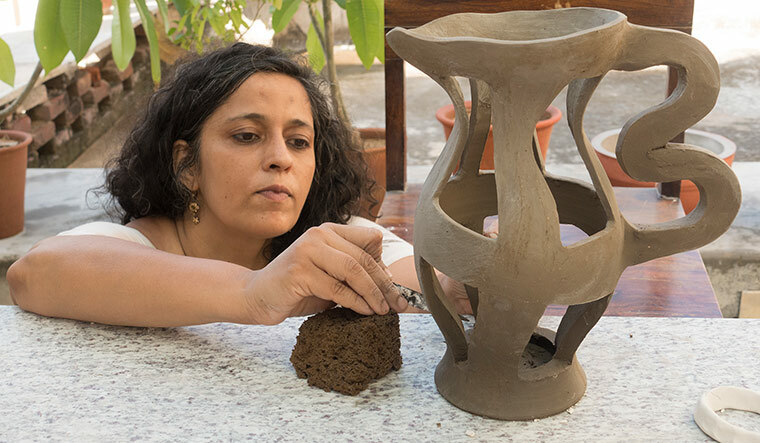 Breaking Ground, India’s first ever ceramics triennale, from August 31 to November 18 at the Jawahar Kala Kendra in Jaipur, will unfurl the scale of contemporary clay practice in India, strictly for art’s sake. It will be an audacious attempt to shake off the baggage of tradition and showcase more “futuristic” installations in clay. “As a viewer, whatever you understood that could happen with clay, is off the list in this Triennale,” says Kumar. His installation of 101 platters titled Circle Uncircled was probably the first ever ceramic work to be showcased at the India Art Fair in 2015. It was acquired by the Kiran Nadar Museum of Art. Objects made of clay are formed into a shape, baked in a kiln, glazed and re-fired to harden its shimmery veneer. But, what if the clay remains unfired? Adil Writer, ceramist, painter and architect from Auroville, where he is a partner at Mandala pottery, has worked with local clays which are not fired in a kiln. Writer would paint abstract landscapes as a child, and this abiding impulse informs much of his sculptural creations. While 80 per cent of his work is functional ceramics for boutiques, hotels and restaurants, it is the other 20 per cent which is exciting. It takes him around the world for residencies and workshops, and brings out the abstract expressionist in him, so to speak. 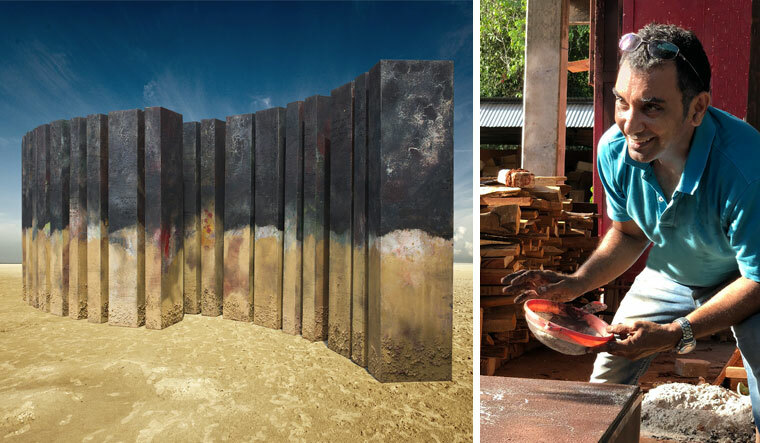 For the triennale, he has invoked an “in-the-still-of-the-night, banjaric desert landscape” on free-standing wooden frames called A Deserted Barcode that is 20 feet long and 7 feet high. The seeds of the barcode idea germinated at a residency in China in 2010, where Writer could not help but respond to how an Indian perceives China’s place in the modern world: a consumerist mecca circulating products and goods across a spectrum of prices and quality. Hence, the barcode. His barcodes are essentially clay paintings with acrylic on canvas. “So as I spread the goop on canvas, I abandon control and relish the adrenaline! Brushes do not feel right. As I move the canvas around, the clay mix flows and mingles with water, medium and paint. It is mesmerising and I can only sit and watch as the surfaces crackle, rupture, crinkle and hiss, drying into myriad patterns exuding an ancient energy,” says Writer. He attributes much of his success as a ceramist to the training he received from his gurus Ray Meeker and Deborah Smith of the Golden Bridge Pottery fame in Puducherry. “The triennale is going to put Indian ceramic art on the world map just like Kochi Biennale did to Indian art in general,” he says, pointing to a good mix of international (12) and Indian participants (35). Originally from Delhi and now based in Jaipur, Shirley Bhatnagar—known for eccentric designs in stoneware and porcelain—injects humour, wit and drama in her anthropomorphic cups, teapots and vases. Variously titled Caught Red-handed, Drama at Home or Husband and Wife, they show humanised sets of vessels which commune and interact with quirky facial expressions. With Broken Promised, her artwork at the Triennale, she has laid out an elaborate dinner table with spoons and plates, and forks and cups. But, the promise of a charming feast is only a tease. The utensils are contorted; there is an air of dysfunction and betrayal. A stately teapot has a drooping spout and the cups are interlocked. Bhatnagar has collected absurd election promises from the 1950s to the present, and illustrated them in her ceramics at the dinner table, without naming leaders and political parties. “There are politicians who have promised to defeat cancer in three years, expel 20,000 gypsies, etc., and I am working with qualities of exaggeration. This entire set is an exercise in seduction,” says Bhatnagar. For Mumbai-based Madhavi Subramaniam, the triennale gives her a chance to further push forward her exploration of the interconnection of nature and urban culture in Forest of Shadows. She is using stoneware, projection, and light and shadow as materials in the show to create an immersive atmosphere with Windows on two opposite walls, which are constructed as abstract distillation of city structures and floor plans. Juxtaposed against Windows is the ‘forest of trees’, reminiscent of Jaipur block printing. Recently, a museum in Singapore commissioned her to make a sculpture on the concepts of colonised labour and rubber plantations. This is expressed through 1,000 wheel-thrown cups along with archival photos. 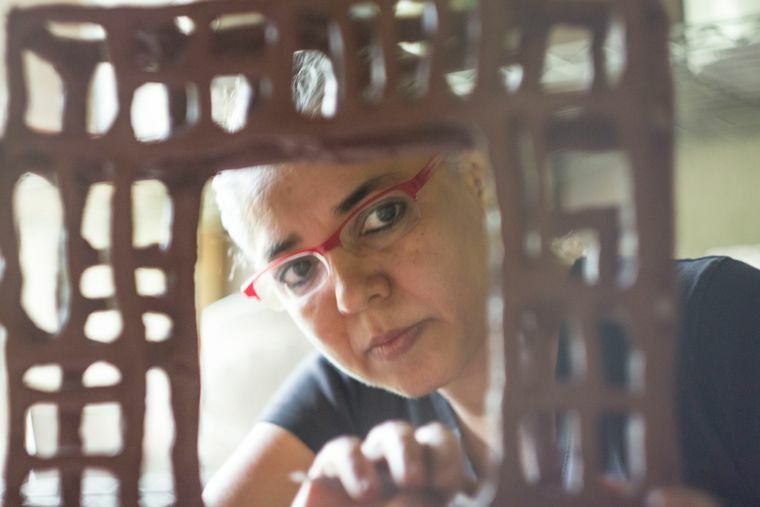 She highlights how the use of clay is evolving in the hands of contemporary Indian artists today. “At the triennale, clay is presented in raw or fired form, as terracotta, stoneware or porcelain, in combination with other materials as well as with new media like video, photography and 3D printing; clay is seen in performance, installation and interactive art works,” she says. It is almost like coming full circle, considering the many creation myths that say man was first fashioned out of clay.